Karin Høgh‘s focus in her presentation on Podcamp was usability, and by giving a multitude of examples she showed that this is not something that podcasters have given much thought. Starting out, she gave her definition of a podcast, which you can see above. She also pointed out that this excludes streaming radio or sites that simply publish a download link to an audio file. 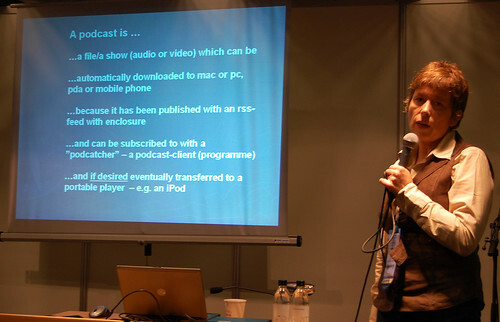 Thomas Plessis objected, saying there’s not necessarily a need for an RSS feed. – Most people want to listen on the website, he said. – The definition is something we have to talk about, Karin Høgh replied. For me the feed is important, that you can subscribe and bring it with you automatically. Language barriers – for instance, which gender is the word podcast in languages where this is relevant? definitions – is video also a podcast, and if not, what do you call it? People wonder: Do you need an iPod to listen? People wonder: What’s an RSS feed? People wonder: Subscribe? – I don’t want to give them my credit card! People wonder: Synchronization – what is that? – Most publishers don’t care about usability because it costs money and it’s an experiment. They think people who want to listen will figure it out. Karin Høgh mentioned a number of important factors in usability for podcasters: Keep it simple, don’t use the word ”subscribe”, keep it accessible for all – non savvies, stupid people, the blind, colour blind, old people etc. – Do we need standards?, she asked. – I think we do, so as less advanced people can start doing this. Her solution is a service called PodHandle, which is supposed to do all of this for you in easy steps. It looked simple enough, but I am also quite sure there are a number of similar services already available. To check out all my photos from Podcamp, check out to my Podcamp Flickr set.